Synopsis: Lost Items Found. Paranormal Investigations. Consulting. Advice. Reasonable Rates. No Love Potions, Endless Purses, or Other Entertainment. 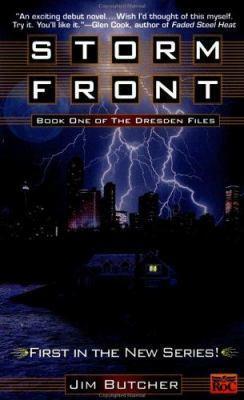 Review: I was first introduced to Harry Dresden when a group of friends started excitedly talking about the series. They were batting around ideas for their next tabletop RPG game, and the game based on the books was brought up as a possibility. The series sounded amazing, and one of them loaned me the books, and after the first few pages, I was officially hooked. This isn't your average urban fantasy where the forces of evil are pitted against the dashing, good looking, hero. Harry is a down-to-earth, can't-keep-his-mouth-shut-to-save-his-life, wizard. You'll be pulled along laughing and sometimes, holding your breath, on the many adventures Harry runs into and through.